Violence. Drugs. Family values. No, this is not a game of “one of these things is not like the other.” This is Breaking Bad. For about five years now, Breaking Bad has given us some of the most earth-shattering moments in television history, and come Sunday, it will all come to an end. And though this is a voluntary departure initiated by BreBad creator and principle writer Vince Gilligan, viewers are – quite understandably – heartbroken. “I’m really upset that it’s all ending,” said Ashley Cooper, a junior in the College of Arts and Sciences. Aren’t we all? A lot can happen in five years, especially in Albuquerque, New Mexico, where the show takes place. Since chemistry teacher Walter White left the education game and became one of the greatest drug lords since Scarface, we’ve seen severed heads attached to turtles, bodies dissolved in vats of acid, pizzas thrown and subsequently abandoned on rooftops and a whole lot of rocks – er, minerals (sorry, Hank!) And even in its final season, BreBad is still surprising fans. But there’s so much more to BreBad than the insane plot twists. Beyond this, viewers who have watched certain characters evolve and struggle for five years have come to love them with the kind of affection once reserved for family members and significant others. Similarly, other characters have garnered a deep personal hatred from the BreBad fan base (Poor Skyler White! 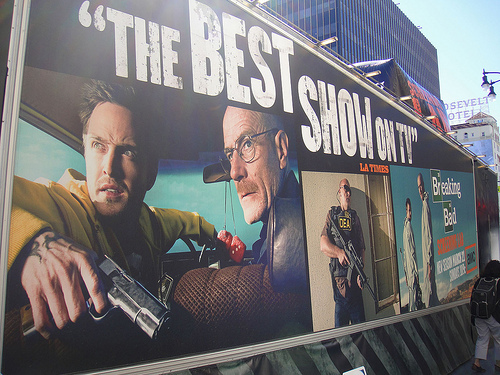 ), especially the show’s underdog-turned-mad-dog Walter White. Gilligan has repeatedly described BreBad’s premise as “Mr. Chips turned Scarface,” and viewers seem to be following that template in their feelings toward America’s most infamous chemistry teacher. As for predictions on how it’s all going to go down? There’s really no telling where Vince Gilligan will decide to lead us all in those precious final 75 minutes of Breaking Bad, but like a blue-meth addict, I can’t wait to get my fix.